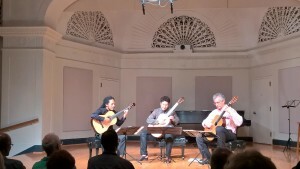 This newly named ensemble with João Luiz, Francisco Roldán and AMR will perform at the Mannes Guitar Seminar representing their connection as guitar faculty at New Jersey City University. They first performed in January for the Composers Now Festival in NYC and at the Guitar Sunday at NJCU event in April. Along with music by Radames Gnattali and João Luiz from Brazil, the trio Cuerdas al Aire will be premiering an arrangement by João Luiz of music by Puerto Rico’s most famous composer of boleros, Rafael Hérnandez (1892-1965).